President-elect Donald Trump’s position on the conflict in Syria has been a confusing assortment of positions, the latest of which – his call for a safe zone in Syria – seems informed by his most recent conversations with candidates he interviewed for the position of secretary of state. But all of his statements carry within them an inherent conundrum, two contradictory perspectives that will be hard to reconcile in Syria: his stated desire to work with Russia, or at least please Vladimir Putin, and his expected efforts to contain Iran. Beyond the question of whether Trump will try to rip up the nuclear deal there is also the issue of Iran’s ascendant power in the region. Trump made no secret of his admiration for Russia’s president during the US presidential campaign, and his willingness to deal with Vladimir Putin. But Trump’s appointments of Lt Gen Michael Flynn as national security advisor, James Mattis as secretary of defence and Mike Pompeo as CIA chief, form a trio that looks geared for a fight with Iran. Tehran has played a pivotal role in Syria to keep Bashar al-Assad in power and crush the rebels in Aleppo. But Russia and Iran are working closely together in Syria, even if they don’t see eye-to-eye on everything, including the outcome of a deal. Randa Slim, an analyst with the Washington think-tank Middle East Institute, said there’s no indication from any of the people around Trump that they have a formula whereby Trump would square these two contradictory positions, that are diametrically opposed in Syria. “Trump can negotiate with Russia but unless he’s willing to accept a formula in Syria that keeps Assad in power, (it) will be a hard sell to the Iranians,” she said. He would also need to strike a deal that would be accepted by the Saudis and other Gulf countries that have a stake in the conflict. Last week, and for the first time, Trump called for safe zones in Syria. Rather than a fully-formed proposal, it seems more like a position adopted after gleaning information and views from conversations with potential candidates for the position of secretary of state, like former CIA chief David Petraeus, who was recently still advocating the introduction of safe zones. This statement puts him at odds with both the Russians and the Iranians as they move forward with the Turks on steps towards a political settlement in Syria. Neither Tehran nor Moscow would be willing to consider safe zones, which would de facto help the rebels establish areas where they can regroup and continue battling Assad. During the presidential campaign, Trump’s focus was on the fight against so-called Islamic State and he indicated he would give up supporting the Syria rebels. This was welcomed by Syria’s President Bashar al-Assad immediately after Trump’s victory. 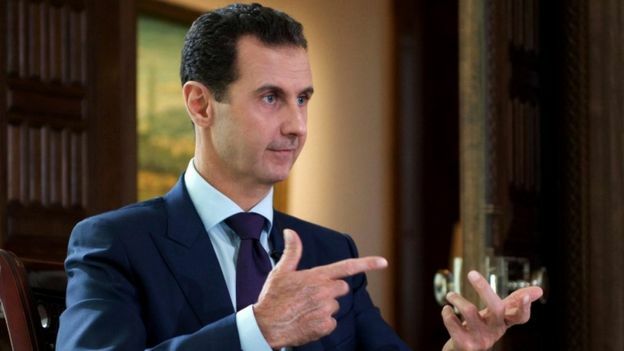 “If (Trump) is going to fight the terrorists, of course we are going to be ally, natural ally in that regard with the Russian, with the Iranian, with many other countries,” Assad told Portugal’s RTP state television on 9 November. 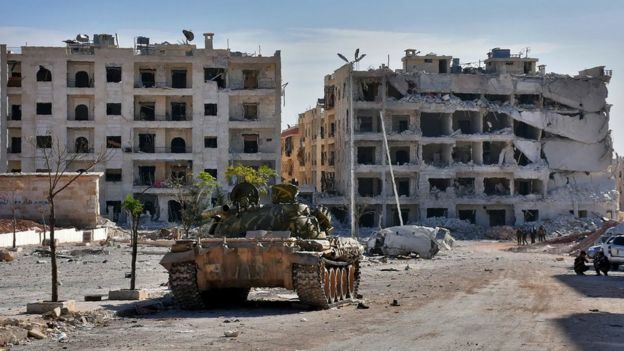 A de facto division of labour could emerge in Syria whereby Iran and Russia finish crushing the rebellion, while the US intensifies its campaign against IS. 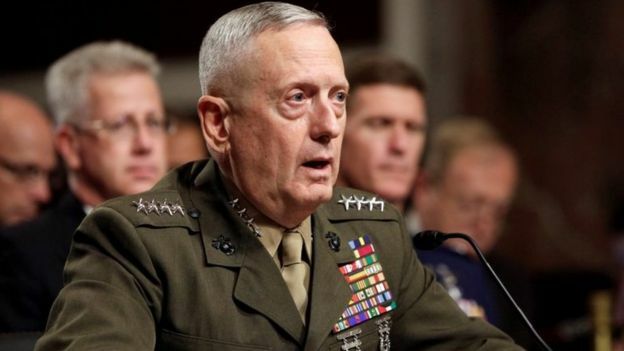 But this would further embolden Iran – and again run counter to the strong views of Trump’s national security team on how to deal with that country: Mattis has said that the three greatest threats to the US are “Iran, Iran, Iran”. But already Iranian officials are gloating about their advances in Aleppo. “Aleppo was liberated thanks to a coalition between Iran, Syria, Russia and Lebanon’s Hezbollah,” said Yahya Rahim Safavi, a senior military adviser to Iran’s supreme leader, in Tehran on 14 December. Saudi Arabia could be willing to cut a deal with Russia that helps the kingdom extricate itself from the Syrian quagmire – where it has backed rebel groups for five years with little success. But for Gulf countries, an ascendant Iran remains a key concern, as fears grow about a Shiite crescent from Iran to Lebanon, through Iraq and Syria. 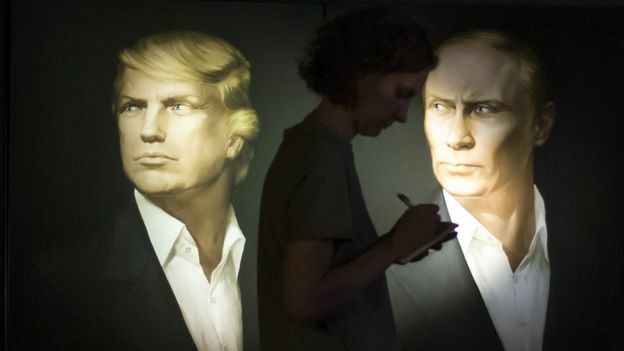 Image captionPortraits in a Moscow pub – can Trump and Putin work together on Syria? The key to such a deal would be Trump’s advisers telling him “let’s do something that stops Iran from being the key power in charge in Syria.” The formula for such a deal would be hard to find: Iran has no incentive to agree to such an agreement and it’s unclear whether Russia could impose it on Tehran. But Trump’s appointments of Flynn, Mattis and Pompeo have reassured America’s allies in the Gulf who felt that Obama’s eagerness to reach a nuclear deal with Iran came at their expense, and emboldened Tehran – which has fed regional conflicts, including in Yemen. But the central conundrum of how to combine that approach towards Iran with a desire to work with Russia in Syria remains intact.